Elite Race Management is proud to be the official timer of the D.O. Believe Foundation’s Sixth Annual “The Dominator” 10k/5k Run & Walk. Proceeds of the run will support the D.O. Believe Foundation and life saving research at the Nemours Center for Childhood Cancer Research, located right on the campus of Nemours/Alfred I. DuPont Hospital for Children in Wilmington, DE. D.O. 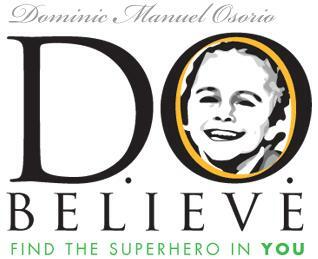 Believe was created in memory of a local child and hero, Dominic “The Dominator” Osorio. Dominic earned his angel wings in November 2009 after battling a brain tumor. Dominic’s determination, courage and enthusiasm helped him think positive and believe that a miracle was just around the corner. The race will be held rain or shine, and no refunds can be given. The 5k and 10k courses both begin at Blue Dot Services of Maryland and proceed to the northern section of the Ma & Pa Trail (gravel and pavement) before finishing at the same location as the start. All participants will receive a t-shirt (sizes and availability not guaranteed to those registering after 9/9), a drawstring bag, and all 5k and 10k finishers will receive a finisher’s medal! Complete “The DOMINATOR” (5k race & 10k race) and receive both finisher medals along with a special finisher’s medal! The races are chip-timed! There will be a water station on the course, and water & sports drink at the finish line. Course marshals will direct racers at all major turns. Awards and refreshments will be available post race. Packets will be available for pickup on Saturday, September 24th starting at 6:45 AM @ start/finish line. Additional packet pickup opportunities may become available, so check back for the latest information!